Last Thursday night after my blog on “What If I Hate Being A Mom?” posted, we went to the movie Cinderella at the dollar theater. I’ve wanted to see it for months but my boys didn’t want to go. I tried to make them go Wednesday night but because they didn’t get their chores done and one of them threw a giant fit, we had to stay home. I drug them there Thursday and we loved the movie. But afterwards I lied in my bed and cried. I don’t know if all of you have seen it, but the theme struck me to the core – Have Courage and Be Kind. I have definitely not had courage and have not been kind. My new goal is to try a little harder to be a little better. This week I’m still tired and overwhelmed, but I’m looking for the silver lining. Last night I whipped out our Good Things Jar. It’s been half a year since we started adding “good things” strips into the glass vase that sits on my husband’s dresser. I smiled and teared up as I read some of the entries. There aren’t many – we’ve kind of forgotten to document the good – but the ones we have are priceless. Both my oldest two boys wrote a strip about their school and education. One of them showcased their smarts by spelling supercalagragilisicexbeadlidotios on his strip. I wrote about when we were able to crawl out onto our backyard ice rink to fill in the snowy holes, when our baby girl was blessed and when we got new kitchen cabinets. Someone wrote strips each for food, money, and dad’s job. There are strips for our 3-year-old finally learning to go potty on the toilet and for our baby girl starting to sing. But there were two strips that tugged at my heartstrings and helped me put my life and my motherhood calling back into perspective. After all we go through together as a family, after all the nagging, the yelling, the homework time and the chores we make them do, one of my boys still thinks we are nice parents. I’m going to cherish this strip and pull it out again on a dark day when my kids and I are butting heads. Finally, the other strip said – A kind Savior. One of my two oldest boys listed his eldest brother as a good thing. Boy how I felt the impact of that strip when I pulled it out of the jar last night. Because even if I haven’t had courage or I haven’t been kind, I have hope. Because of that kind Savior I can start over. Because of him I can make it through the “I hates” of motherhood. He knows how overwhelmed and tired I feel. He knows how inadequate and unworthy I feel. And he knows how to help me make it through. The dirty dishes are not going to magically melt away and I’m not going to suddenly start remembering all the things I need to buy at the grocery store, but through that kind Savior the burden I bear can be made light. 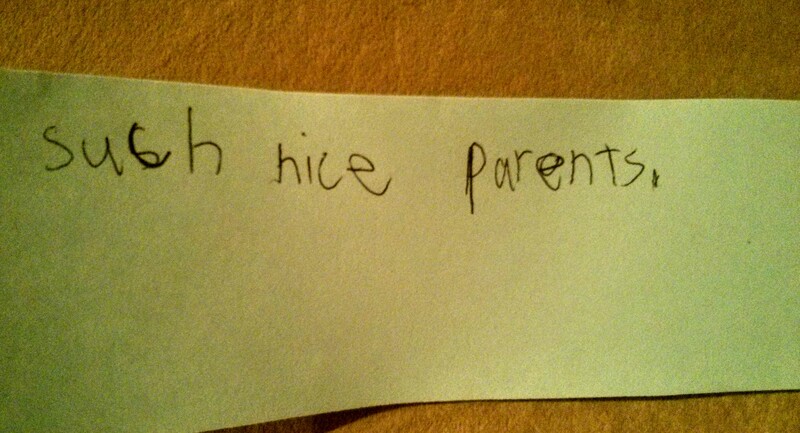 Now I just need to turn to him more often so I can live worthy of the “such nice parents” title. Here’s to having more courage and being more kind. Here’s to adding more good things into our family jar.